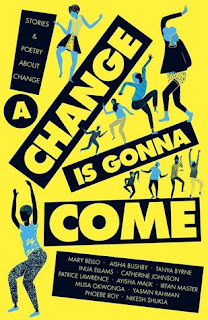 A Change Is Gonna Come the anthology of short stories and poems written by 12 BAME authors and published by Stripes Publishing is my favourite book of the year so far. I hoped it'd be great when I first heard of it and I had high expectations for it, for sure. But I wasn't quite prepared for how important and inspiring it'd be until I finally sat down to read it. I loved it so very much. I think there was just something special about reading so many stories in one collection with people of colour as protagonists. Like, I didn't even realise how emotional that would make me. Because it's so very much not what I'm used to. Being mixed-race has meant that so often I don't see myself in the books that I read and it isn't until I come across a book like this that these strong feelings come out. And this book is such a celebration. I felt weepy reading it. But also inspired. Each of the short stories and poems in this book were really well-written and providing such a wonderful emotional arc within not very many pages. I love how empowering this book felt, how emotional it is, how important it is. Aside from it being a collection of short stories and the occasional poem about people of colour, the first story is also about a girl with OCD and the story by Tanya Byrne is about lesbians. And I cheered at this. Both mentally and probably literally when I read that. I want more intersectional stories in my life. I need them. While a lot of the stories were contemporary there was also some magical realism in there, a story about time travel and kind of a dystopian read, Catherine Johnson's story is inspired by actual historical events. And I liked that things got changed up like that. That each of the authors had their own visions for 'change' and what that means. Some of the stories centred around race issues: Nikesh Shukla's story is about a friendship falling apart after Brexit; Ayisha Malik's story is about visiting the Calais refugee camp. I thought it was great that this book took into account such current events but also that the stories balanced out being serious and playful whilst all being hopeful at the same time. There aren't that many books about or by people of colour in the UK right now. So this book feels like such a necessity. Representation matters. People of all ages need to see themselves in books. I hope A Change Is Gonna Come signals actual change amongst publishing in this country. I, for one, read this absolutely amazing anthology and I felt utterly inspired.